Born and raised in Michigan, Dr. James Hanchett DDS received his Bachelor of Science Degree in chemistry at Western Michigan University. He completed his Doctor of Dental Surgery Degree at the University of Detroit Mercy Dental School. His personal dental care philosophy is to treat his patients in the same manner he would expect to be treated. 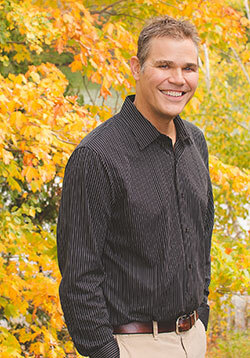 Focused on community, quality, and comfort, Dr. Hanchett is dedicated to staying abreast of the latest techniques and helping his patients make informed decisions. Dr. Hanchett and his wife Jennifer enjoy spending their free time with their four children. He also has an avid interest and skill in woodworking. Additionally, Dr. Hanchett has completed over 1000 hours of continuing education classes. Debbie has been with Water's Edge for 25 years. She makes each patient comfortable by being friendly, outgoing, and compassionate. Ask her about: scheduling appointments, insurance. Debbie is married with 2 children and 2 grandchildren. She loves camping, scrapbooking, and cooking while spending time with her family and friends. Kristy Currie is our Office Manager, joining our team in 2018. She is excited to be a part of Waters Edge Dental. She looks forward to incorporating her energetic personality into working with our patients and staff. Kristy was born and raised in the Upper Peninsula, a former personal trainer/fitness instructor, who still enjoys running. She is married and has 3 children. Kasi has been a Dental Hygienist for 20 years, and with Water’s Edge for 13 years. She prides herself on being gentle and friendly, loving to laugh with her patients. Ask her about: your oral health and home care. Kasi is married with 2 children. In her spare time, she enjoys sewing, crafting and making cards. Cheryl is married with 3 sons and two grandchildren. She likes to go boating, hiking, and cross country skiing. Ginger has been a Dental Assistant for 20 years and with Water’s Edge for 8 years. She is passionate about her job, and likes to make patients feel at ease by being helpful and outgoing. Ask her about: what to expect during and after dental procedures. Ginger is married with 3 children. Outside of work, she enjoys playing basketball, soccer and spending time with her family. Amanda joined our team in April 2015. She loves her job and co-workers and strives to make sure patients are as comfortable as possible during their dental visits. She lives in Cheboygan with her husband and their son. Amanda enjoys playing hockey, reading, and spending time with family.